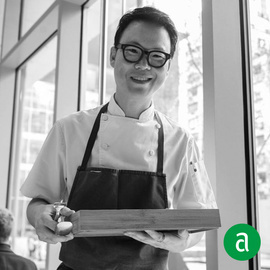 Jiho Kim, Executive Pastry Chef at The Modern in New York, shares his career timeline and words of advice for up-and-coming professionals. I keep my team inspired by showing them how much I care about the finished product and my career. I find inspiration ​for what I do everywhere! I'm not kidding! I read a lot of savory cookbooks and then try to adapt those techniques, ingredients, and recipes for sweet and dessert applications. The recent trend and enthusiasm in the industry toward Asian food and ingredients is very exciting. I think the books that you need to have are the El Bulli cookbooks. They are essential. Guest feedback is what drives me forward and inspires me to continue to work and excel. I look for people who are eager to learn and have a positive attitude. Anyone can learn to do the job if they are passionate and willing to learn they will succeed. ​The most important skills to have are a positive outlook, the belief that you can figure out how to make anything you dream up, and the willingness to take on whatever, whenever.